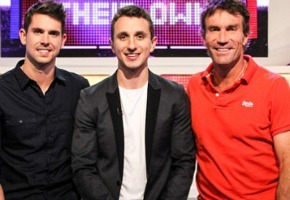 TEN has finally pulled A League of Their Own from Monday nights after disappointing ratings. Next week it will be replaced by double Modern Family episodes. This week the show rated just 328,000. TEN has also responded to Nine’s head to head battle with David Attenborough on Nine, by adding an extra half hour episode at 6pm in place of The Simpsons. Now a double episode of David Attenborough’s Natural Curiosities airs from 6-7pm this Sunday (an idea that was tipped here). While Nine has a history of Attenborough in this timeslot, TEN’s series is newer and has him as an on-camera presenter while he only narrates the Nat Geo 2012 series Nine is airing. That said, I’d still expect Nine to come out on top of this battle. If there is only one more episode of ALOTO – then just screen it on Monday night as per usual. Putting MF repeats – again – is just killing that show. Remember what happened when Nine repeated 2.5 men 5 nights a week? This is what is happening with MF. Ten have destroyed many shows with poor scheduling. Whoever is making these decisions should be fired by now. Australian content is anything made in Australia or NZ, or with a new voice over added in Australia or NZ. It must make up 55% of content between 6am and Midnight on a main channel. There is points system for secondary channel which allows repeats (but gives them less points). There is also a local drama quota where they must show a certain number of points worth in primetime over a 2 year period. We used to get a lot of sketch comedy because it counted equal but they changed the weightings to favour dramas or sitcoms. There are also requirements for Children’s TV and for regional (local) content for regional broadcasters (this is currently being reviewed). Will Ch 10 show season 2 of Natural curiosities? There were only 5 eps in season 1, so the double wont work next week otherwise. Always think it is sad when a show is axed and not given a chance to work in another time slot. Ok clearly did not work on a Monday This show should have been given a chance on another night. Maybe Saturday night given it’s targeted as family entertainment. The promos looked like it was a sizable production. I never watched it as the time slot never suited me. @Billy C – Different quotas. @Pertinax It wouldn’t qualify as local content. Only drama and sketch does. Ten had nothing better to show, needed the local content and having paid for it had to use it. Now they have decided it is time to make some changes to their lineup for summer. Ten no longer really has a ratings season. They have had to show most of their stuff on the US rating schedule. So they have a low rating season and an even lower rating season. @William there’s one episode left. Bit late for ‘resting’ a show me thinks! @SaxyBre84 – Ten classified that episode as M which they can’t air at 6pm. They would have skipped it again. I ‘accidentally’ saw an encore of A League of Their Own the other night as I couldn’t find anything else to watch. It was the episode with Fitzy, Eamon, Joel Creasy and George Colambaris. I really really enjoyed it! And I am not a sports fan in anyway, don’t follow or watch any sport. But the show was funny, interesting, light hearted and had lots going on. It reminded me of Spicks and Specks. I think maybe it was marketed poorly – not showing what it was really like – and also Channel 10 are always going to start from behind now given they have such a bad reputation for bad quality shows. How about a brand new double ep of New Girl. David, is this correct with A League of Their Own? The final episode was always scheduled for this Monday and Modern Family repeats scheduled following week. Ten website still has League in there. Is the change for this coming Monday? Does this mean 10 are moving the final ep of ALOTO to Wed 7.30 instead of Modern Family? May have been a nicer timeslot for it from the onset. Yay the tv stations are slowly coming to thier senses about reality tv.get ride of it all. Looks like Tommy Little’s TV career is on hold. Both shows he was involved in with were flops.However, I still believe that Tommy has a bright future. About The Simpsons not A League Of Their Own. So A League of Their Own is dropped and replaced with more Modern Family repeats (like we really need that). Maybe the show would get more viewers if they had better guests. Why take off Simpsons for an extra half-hour of David Attenborough? I was quite enjoying the Sunday Simpsons as the episodes were replays of the current season. I believe this Sunday was going to be the skipped ep What Animated Women Want. Considering there was only one episode left of A League of Their Own I can’t see why they bothered moving it. And for more Modern Family? They are killing that brand with too many repeats. The main problem with ALOTO is the choice of guests. Not diverse enough and just the same old Ten faces. One episode left of ALOTO. What’s the point doing it now?